Do you ever think about getting older? Or aging? I remember when I was a teen I thought 50 was 'OLD'! But now that I am over 50 I just happen to think 50 is young. But one thing is for sure...we are all getting older. 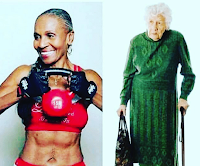 Because if you are not getting older, you are dead! So my attitude is, celebrate every birthday! I have heard it said that 'aging isn't for the faint of heart'. I know it isn't always easy. First you need glasses, then you need a hearing aid, the knees don't like the stairs, never mind watching the diet, due to cholesterol or blood sugar, etc. Those things are hard. But I also believe the other thing they say... "age is all about attitude". I have met people who are such an example to me. I have met people who are 'young' by the number of candles but are old in life. I have met others who are 'old' by the candles, but young in life. I have a friend here in GDL who is just such an inspiration. She is one of my neighbours, and someone of whom I can honestly say, that when I get old I wanna be just like her! Today she turned 70 years young. I say that because she is the most youthful lady I know. She enjoys life to the fullest. She laughs, she smiles, and she acts crazy. She is the life of the party. Just prior to her birthday she went and got a small tattoo of a butterfly on her shoulder. She proudly showed it off and told all of us that we could only get one when we turned 70! I love it! What an attitude. But what makes one person seemingly ageless and another old? When I asked her about it, she said it all in your attitude. Yeah, she remembers when she could do things that she can't now, but who wants to be cranky. Look for the sunshine, she says. I know that this picture seems extreme. The bodybuilder vs. the little old lady. 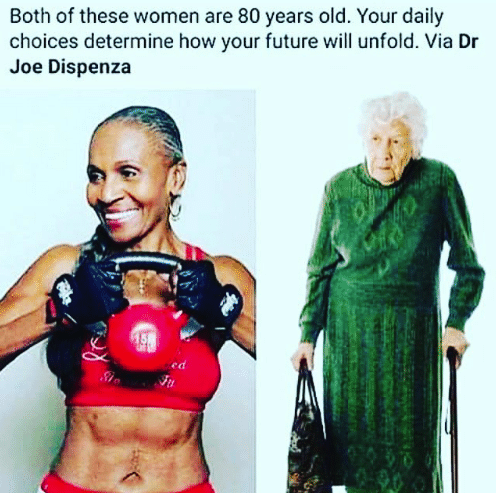 BOTH are 80 years old! But I know the bodybuilder women is the real deal. She inspires me because she took on life after 50, upon the death of a loved one. She exudes joy when you watch an interview with her. I am not denying that life is hard, that aging is tough. I feel a little of my age every time I hang out with my sons, and their boundless energy. But I want to be like my neighbour lady. I want to be a joy, I want to be sunshine. I always say I am a realist, so as not to say pessimist, but that doesn't excuse me. I need to see the rainbows of promise in life, and celebrate the life God has given me. I have the best reason ever, to do that! Jesus lives in me. He loves me unconditionally. His grace knows no end. He forgives me. He came that I might have life, and life abundantly. Then, as I start to count my blessings...well, they are many. How about you? What do people see when they see you? Are they drawn to you, like everybody is to my friend. I want to live an ageless life, filled with joy unending. Attitude is a choice. Thanks to my friend for being an example of 70 years of celebrating life. Like A Girl' and 'The Woman Card' boith are the amazing videos and have a great message too. Keep on sharing the good work. Keep it up.